In four blog posts we have detailed the fall of UBS’s Willow Fund. See Credit Default Swaps on Steroids: UBS’s Willow Fund, Willow Fund’s Hedging, Investing and Speculating in Distressed Debt With Credit Default Swaps, Further Reckoning of UBS Willow Fund’s CDS Losses and UBS Intentionally Misled Willow Fund Investors About its Troubled CDS Portfolio. The spectacular collapse of the Willow Fund was not the result of general market conditions operating on the Fund’s disclosed investment strategy. The losses occurred because, rather than investing in distressed debt as it said it would, the Fund’s managers placed a 20-1 bet that credit spreads would widen further and UBS’s investors lost. Investors in the Willow Fund as a whole lost $25.9 million from inception to December 31, 2012. The same investor capital deposits and withdrawals in a diversified portfolio of high yield bonds would have had a $190.4 million gain over the same time period and so Willow Fund investors as a whole lost $216.3 million over the active life of the Fund. 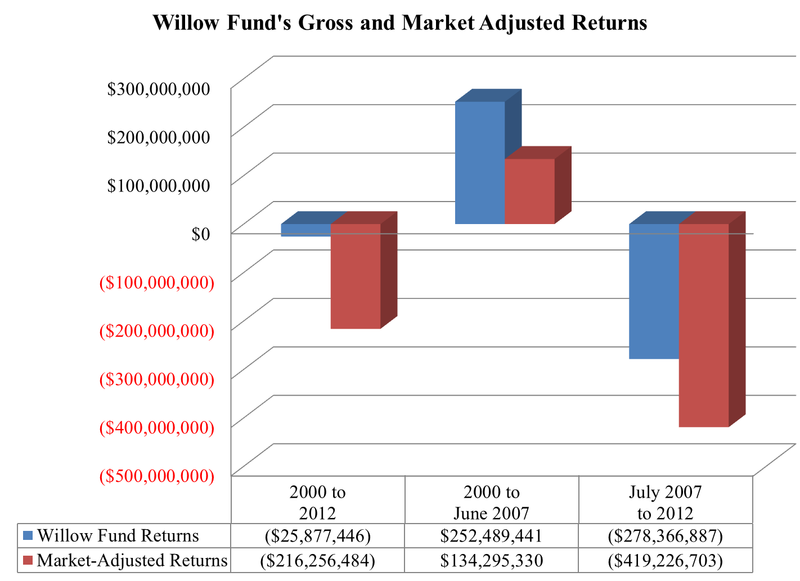 The Willow Fund was really two very different funds. From inception to June 2007, the Fund invested in distressed obligations and hedged some of its credit risk exposure by purchasing CDS contracts. During this period, investors had a gain of $252.5 million. This gain was $134.3 million more than the $118.2 million the same investor capital flows would have earned in a diversified, non-leveraged portfolio of junk bonds. After July 1, 2007, the Willow Fund was completely different than its previous self and completely different than what its SEC disclosures described. The Fund was a high-cost, massive short bet on credit risk. The Fund lost $278.4 million from July 1, 2007 to December 31, 2012. Approximately half of these losses were from CDS premiums the Fund paid but stopped reporting separately in its SEC filings after June 30, 2007. If the Willow Fund investors’ capital values on June 30, 2007 had been invested in a diversified portfolio of junk bonds, they would have earned $140.9 million up through December 31, 2012. Willow Fund investors thus lost $419.2 million compared to the high yield bond market after the Fund changed its strategy (and its accounting treatment of CDS premiums). If instead of investing the members’ capital accounts on June 30, 2007 in a diversified portfolio of junk bonds we just allow the alternative portfolio of junk bonds to continue from June 30, 2007 until December 31, 2012 the estimated market adjusted damages during the second period would be $350.6 million rather than $419.2 million. UBS made over $100 million managing and selling the Willow Fund. UBSFA received a management fee of 1.25% of the net assets of the fund annually which added up to $41.2 million. UBS also received an incentive fee equal to 20% of the Fund’s profits above a high watermark. The incentive fees totaling $54.3 million were added to UBSFA’s Managing Member capital but were virtually completely withdrawn prior to the Fund’s losses and so were not at risk with the Fund’s investor’s capital. See Table 2. UBS also received up to a 2% placement fee for acting as the Placement Agent for the Fund. This completes our five-part blog posting on the Willow Fund. Our working paper on the Fund, collects and expands the blog posts and is available here.